A very short prompt this early European morning. Google is coming to the next Audi A8. Take a look on the nice photos on Google’s blog. To help you figure out where you want to go and how to get there, we’ve also brought Google Maps and Local Search into the A8, and linking it to your desk. You can send business listings directly from Google Maps to your car: search for an address at your desk, send it to the car, and by the time you go to the parking lot your car will know where to go. While in the car, you can use Google Local Search in the same rich quality as at your desk. Imagine you get hungry on the way or want to find a cinema – simply perform a live Google search on your car navigation system and immediately get up-to-date, rich and relevant results. Now my question is quite simple. Google might collect information about users of A8. So, if you will be driving your next A8, in potential, all systems can report about their performance via the Google’s board navigation system. As you can see on the picture, systems are online… Ha! Don’t you think it will be just cool? 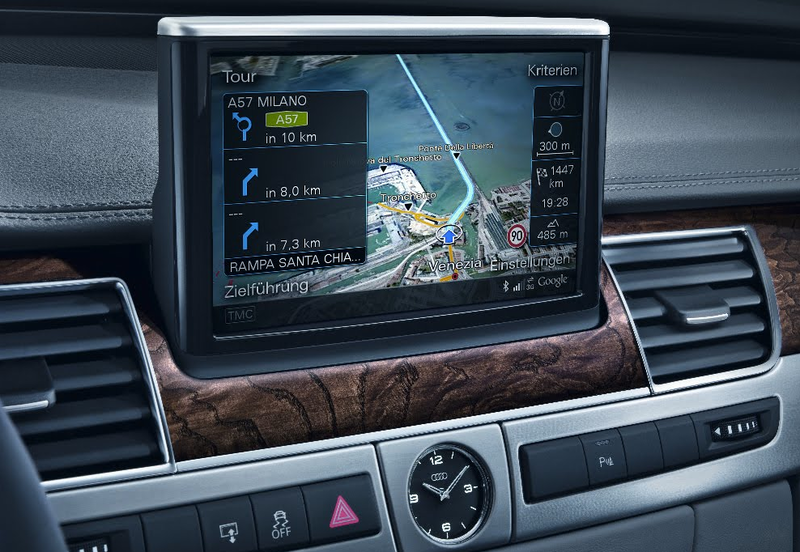 Perhaps, the next step is to have the navigation system requesting infos directly from Audi’s PLM with your A8 systems infomations in order to prevent some failures or to ask you to go to the next Audi garage if there’s one ? Just one more reason to buy the A8! I keep taking care of my current Audis hoping that if I treat them well they will grow up to be A8s. They had something a little bit similar on the original McLaren F1 – the car could send telemetry to head office so they could do fault diagnostics.